Poster of Ajit Kumar, Vivek Oberoi, Kajal Agarwal and Akshara Hasan starrer ‘Vivegham’ poster has been released. Ajit and Vivek Oberoi’s look in the poster is amazing and it is certain that their fans will be getting enough impressions by seeing them in this new incarnation. Earlier, the film teaser has also been released. Ajit Kumar’s upcoming thriller film ‘Vivegham’ had made a new record even before the release. Number of teaser-seekers of ‘Vivegn’ reached 463 thousand. The film is directed by Shiva. Aniruddha Ravichandar has given the music in the film. Most of the film’s shoots have taken place overseas. 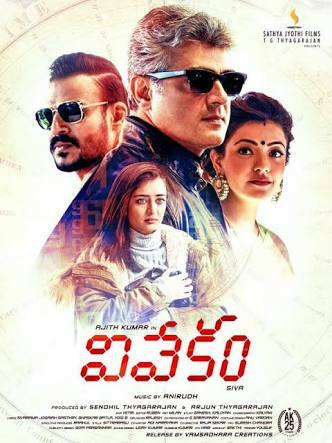 Ajit Kumar, Vivek Oberoi, Kajal Agarwal and Akshara Hassan are in important roles in the film. In this film Ajit will appear in the role of an intelligence agent. After ‘Veeram’, ‘Vedalam’, Ajit and Shiva are working together for the third time in ‘Vivegham’. The film will be released on August 10.